The industrious ant, revered for his amazing strength, is also known for his ceaseless hard work. He holds the moral high ground in Aesop’s fable The Grasshopper And The Ant. What’s not well known is that he probably is a she — nearly every one of these hard-working six-legged wonders is a female. There are millions of two-legged “worker ants” putting in hard days at labor intensive jobs, too. 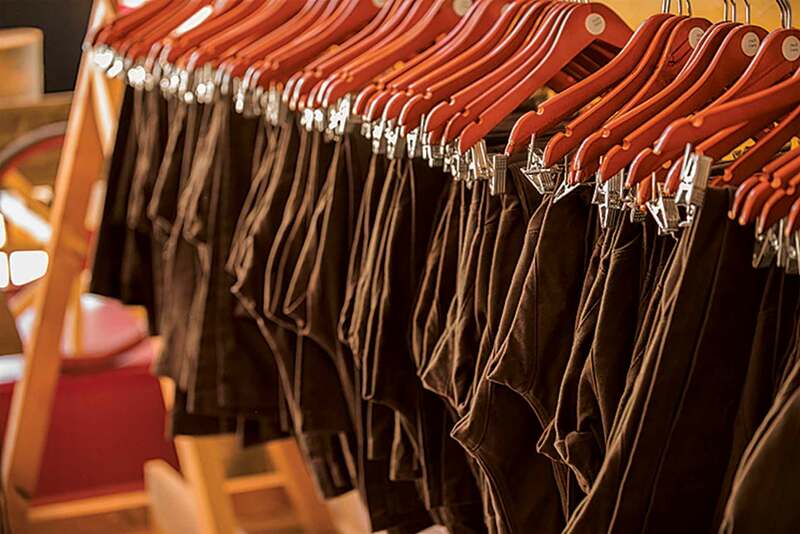 Sarah Calhoun, founder of Red Ants Pants work wear for women, is making sure those busy legs are clad in pants that fit right and work as hard as those wearing them. Much as Levi Strauss developed the first rugged blue jeans for gold miners in 1873, Calhoun recognized a need for sturdy work wear that actually fit the women laboring away on farms and ranches, in forestry and landscaping jobs, fighting wildfires, and so much more. “Women come in all shapes and sizes while men are basically square. But essentially since the time of the gold rush when we have serious work to do, we were forced to squeeze curvy female figures into square men’s pants,” Calhoun says. This is a problem, says the apparel entrepreneur and modern-day frontier woman whose strength and conviction give off a powerful Annie Oakley vibe — a connection further forged by the shiny leather Colt .45 decals sewn on the hips of her pants. Failing pants. While a man swings effortlessly onto a horse, a woman in men’s pants may have a pre-mount routine including hiking up the pants, doing a quick squat to loosen the fabric and then making an awkward swing of a restricted leg with hopes of hitting the stirrup in one go. Too often this journey to the saddle — or into a truck or anywhere else range of motion is required — results in embarrassing seam blowouts ruefully referred to as giving yourself a little air conditioning. She knew she wasn’t the only one with these frustrations and pitched the idea of women’s work wear to several apparel companies. No one bit. But some encouraged her to go into business herself. At 25 she naively thought, “Why not? How hard can it be?” Very hard it turns out, but fate was on her side. Calhoun felt pulled to Montana and moved to Bozeman in 2004 having never even visited the state. Two weeks in she purchased the book Small Business For Dummies and settled into a local coffee shop to read. “I didn’t even know what a business plan was,” she says. Curvy and straight styles are designed to accommodate women’s bodies, but men can and do wear them, too! It was a full two years before Calhoun sold her first pair of Red Ants Pants. She spent 8 months on product design with a pattern maker and got a job sewing backpacks so she could learn the rudiments of the business. She sourced fabric, secured a U.S. cut and sew facility, established financing and, in a move that defies logic, set up headquarters in the remote, stop-light-free, frontier town of White Sulphur Springs in central Montana. “I wanted to live in a rural, ag-based community,” Calhoun explains. The move was inspired when she read White Sulphur Springs native Ivan Doig’s description of his home in his book, This House of Sky. She bought an old brick saddleshop on main street, and, in worker ant fashion, renovated it with her own two hands. She opened shop in the fall of 2006. Calhoun’s pants feature contoured waist bands that are broader and slightly curved with a high rise in the back and a low rise in the front to avoid both binding and overexposure when bending over. A gusseted crotch provides freedom of movement while an extended double knee and a double seat provide rugged strength and durability. A good product is only the tip of the iceberg for Calhoun. “If I can’t run a business with integrity, I don’t deserve to be in business. Nobody does. If I can’t run a clothing company and keep manufacturing on American soil, I don’t want to be in business. If I can’t make it personal, connect with our customers and have fun, I don’t want to be in business,” she says. Those ideals have pushed her pants business, and her town, into the black. Connections. Grass roots marketing made good financial sense to Calhoun. She bought an Airstream trailer, dubbed it The Ant Hill and embarked on a Tour de Pants crisscrossing the U.S. and Canada holding Tupperware-style parties to connect with working women and introduce her Red Ants Pants to them. “It’s what we can afford, it connects us to our customers and it’s a heck of a good time,” Calhoun says who’s also held bar top fashion shows and sponsored women-run derby cars. Her whole business is a culture of women supporting women, connecting people, and fostering heart in small communities. With 5 years under her ant-decorated belt, Calhoun decided in 2011 it was time to celebrate. So she threw a party. A massive party. In July of that year, 6,000 fans came to the first annual Red Ants Pants music festival. She got Lyle Lovett and Jerry Jeff Walker to put on a concert. 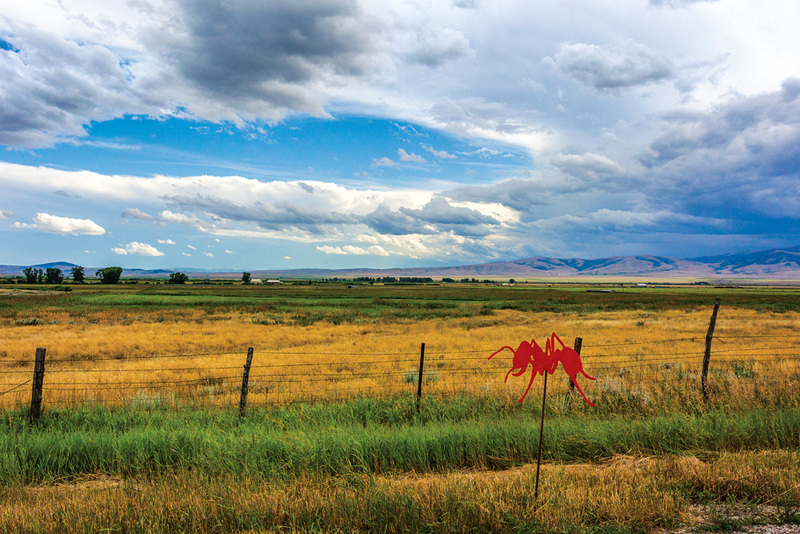 This annual party in a pasture not only brings attention to Red Ants Pants and millions of dollars to a town of 900 people, but it’s a fund­raiser for Red Ants Pants Foundation , something Calhoun uses to empower women and help small, rural communities. Giving back. The music festival draws a diverse crowd, and Calhoun capitalizes on that to help connect people with agriculture. During the festival there are sheep shearing, meat cutting, horse shoeing, timber skills, and other demonstrations. “They come for the music, but if we can get some education or public interest into the mix, why not?” Calhoun says. Money from the festival is also used to host a timber skills workshop that allows women, and men, to learn how to use chainsaws and other forestry tools in a safe, unintimidating environment. “I want to empower women,” Calhoun says. And she’s done just that. Kris Fitzgerald met Calhoun when she went to White Sulphur Springs to buy her first pair of Red Ants Pants. When asking about good camping in town, Calhoun offered her backyard. Fitzgerald, a landscaper, has become a friend, a customer, a grant recipient and a fan. “The pants are great, but the more I learned about the company, the more I wanted to support it,” she says. Gaining ground. Calhoun’s efforts haven’t gone unnoticed. Red Ants Pants wearers applaud her support of U.S. businesses and rural communities. She’s been honored at the state and national levels and even invited to the White House to speak with the President’s advisors on issues such as tax reform. It took 8 years to get in the black, but Calhoun is forging ahead like the tenacious frontier women before her. “As women, we can do whatever we set our mind to in America. We’ve got more opportunities than ever, and that’s a dang good thing,” she says.